The Colgate 26 is absolutely the best value you’ll find for a daysailer and racing keelboat in the 22’ to 30’ range. Construction starts when an order is received and generally takes a minimum of six weeks from start to finish. When you place your order, a 20% deposit is due, with final payment required when you are notified it is ready to be delivered. See our Colgate 26 Complete Sail Away Package and what’s included. If you wish a custom color for your hull (which as you can see, truly can be gorgeous), this will be done at Snead Island Boat Works, also in Palmetto, Florida. If you want barrier coat and bottom paint, we have Snead do this too. Custom hull color and bottom paint are not included in the sail-away Colgate 26 sailboat price. You have two delivery options. Order a trailer (optional) and we’ll have the boat on the trailer ready for you to come pick up your boat yourself. Or ask us to arrange for a boat delivery service to bring it to the yard of your choice. It can be on a trailer or not when delivered by truck. Delivery by us is, of course, also an extra charge as is a trailer. The very lowest Colgate 26 sailboat price you can get is available if you order a Colgate 26 for Offshore Sailing School to display in its booth at the U.S. Sailboat Show in Annapolis, MD each October. 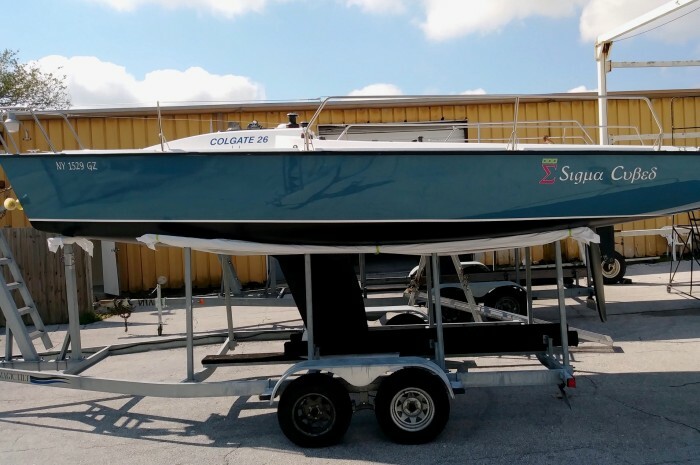 Learn more about this Colgate Sailboat Special. You can go for just the standard white hull version, or a custom color like this beautiful navy blue that was ordered for display in the 2013 show. In this case, Offshore Sailing School brings it to the show with its van, and then you pick it up for delivery to your home port or we arrange for a trucker to deliver it. Rig It and Set Sail! When the boat arrives, all you need do is rig the mast and put the sails on – which generally can be done by two or three people. Tuning the rig is easy. 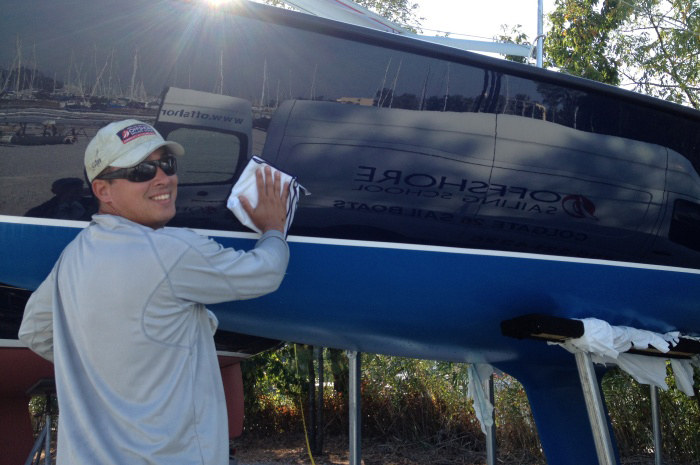 Steve will make sure a handbook is included when the boat is delivered, or he can email it in advance so you are ready to jump into action when the boat arrives.